L: 90.5" x W: 72" x H: 61.5"
Begley Queen Bed Add style and comfort to your bedroom with this Begley queen bed. The frame is fully upholstered and features diamond tufting on both the headboard and footboard for classic charm. Plus, the fabric's charcoal color provides a sleek and sophisticated feel. Add style and comfort to your bedroom with this Begley queen bed. The frame is fully upholstered and features diamond tufting on both the headboard and footboard for classic charm. Plus, the fabric's charcoal color provides a sleek and sophisticated feel. Frame joints are reinforced with screws for added strength and stability. 100% Polyester upholstery on the entire frame provides a stunning look along with a comfortable spot to rest your head while reading or watching TV. Love it, totally what we were looking for. My daughter is so happy with her new bed. She is 13 and was ready to move from her white twin bed that she had since she was a toddler. We bought our mattress set from R&F too and everything was set up by R&F when she got home from school. They did an excellent job. Bed is comfortable and look just like the picture. We went to the store to make our purchase and the sales rep was very patient as she tried out SEVERAL mattress just to get the right one! Great price and even better bed! This bed looks just like the picture. A box spring is required unless you want the gap between the headboard and the mattress to show. We have a pillow top mattress and purchased a 5” box spring that covers the gap and is still low enough that our French bulldog can jump up on the bed. He definitely would not be able to with a 9” box spring. The white glove service was fantastic the bed was completely assembled in about 10-20minutes!!! The bed looks amazing It is a nice fit for the room and has so may options for as far as additional furniture and bedding. The gentleman that delivered it had some difficultly getting it up the stairs in an old Allentown west end twin , but figured out that the sides came off the headboard and were able to get it up the stairs easily. I love the way it looks . I would highly recommend. I moved into a loft apartment and my bedroom furniture just didn't go with the room. 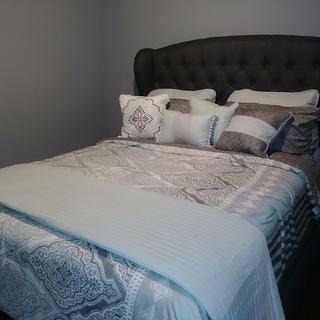 The Begley Queen Bed is well constructed and looks great! The Gateway Brooklyn location has impeccable customer service. Rudy and team were very helpful and made my shopping experience very seem less. Fast delivery and I love the final product! Will shop here again! Love it!. Sturdy and comfortable. Always wanted this kind of bed. Delivery 3 day or less was awesome as well. I was very happy with the purchase. It is at the right height compared to my old bed which was too high off the ground. Additionally, it is sturdier as well. The other great thing about it, is that the bed is both comfortable laying down and sitting up with your back/head resting against it. 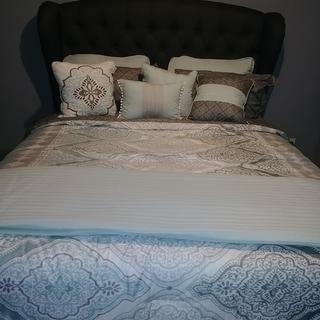 Great bed and good quality. Nicely upholstered and great fabric. My son loves it. What a great experience shopping at Raymour and Flanagan. Conrad was our sales consultant and we could not have asked for a better person. No pressure, plenty of time to look around, always available when we needed help. We will definitely shop again at Raymour and Flanigan. BEST ANSWER: The Begley Queen Bed does require a box spring. Can tou use an adjustable base with this frame ? BEST ANSWER: The Begley Queen Bed is a platform bed, so an adjustable base will not work with this frame. What is the height from the floor to bottom of bed? BEST ANSWER: The black leg is 4 inches (so from the floor to the grey part 4 inches), but from floor to the wood planks that hold the bed is 8 inches. Do I need a box spring with this bed? BEST ANSWER: Yes. The Begley Queen Bed does require a box spring. Does Begley come in any other colors? BEST ANSWER: The Begley Bed is available in the Charcoal color only. Does this bed have extra support under mattress? BEST ANSWER: The Begley Queen Bed is supported by slats and has a maximum weight capacity of 500 lbs. The Begley Queen Bed does require a box spring or bunkie board for proper mattress support. Is the back of the Begley bed covered in the same material or does it show the plywood in the back? BEST ANSWER: The back of the Begley headboard is covered in a polyester fabric. Is this intended to have a box spring?